Crowned British Open 2014 champion. Crowned England Matchplay 2014 champion. Traveling to Germany for 2nd time in a year a 1st but a new venue always makes it interesting. On the Saturday was Muensterland Open where I lost out in a tight 4-3 in last 16 against Daniel Zygla who is a new name to me. He went on to make the semi-finals. The eventual winner was Rick Hofstra beating fellow Dutchman Jeffrey De Zwann in the final. The Bulls Muensterland Classic was played on the Sunday. A shorter format of best of 5 for the early group stages. Group finals were best of 7. Group final beat German Kevin Munch 4-2, Last 16 I defeated Dutchman Matthew Medhurst 4-3. 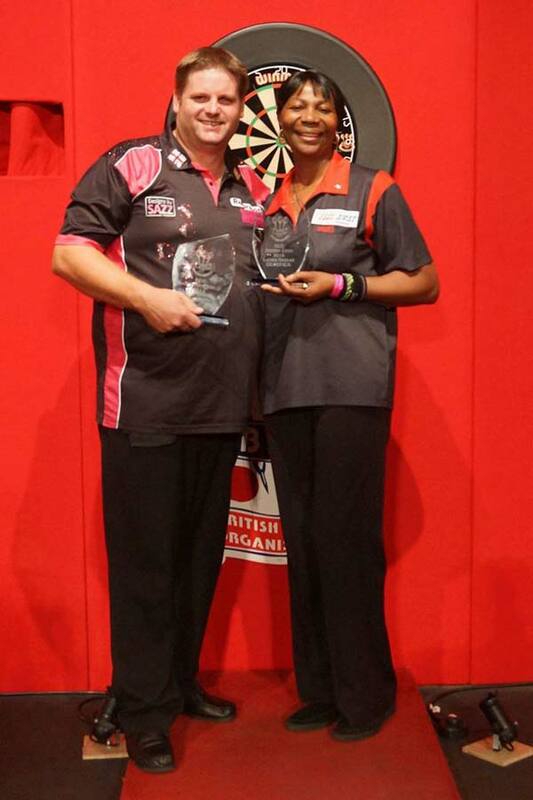 The quarter finals were best of 9, an my opponent was Gary Robson. in tight game I broke his darts in the 7th leg and held my own in 8th to win 5-3. My England captain was my semi-final opponent Tony O'Shea. I broke throw twice early to find myself 4-1 up. Tony broke back to go 4-2 but I broke again with a 12 dart leg with a 140 check out in the 7th leg. Won the 8th with 13 dart leg to hold throw for 6-2 win and a very pleasing 99.1 av. Final I was to play Kent's Pip Blackwell. I broke darts for 16 first leg on double 4. Pip broke me back immediately with classy 104 for 12 dart leg, a scrappy 3rd leg I took after missed darts at double from Pip. This led the way me taking next 3 legs in 13, 15, 18 and 5-1 lead in a best of 11 legs match. Blackwell came back with 2 classy 14 darters on the trot to take it to 5-3 in legs. Pip started leg with darts and 1st 9 dart with scores 95, 60, 140, to my 85, 60, 60. His next score of 41 I punished with a 135 and I followed that with a 137 to leave 24 which shot double 12 1st dart. My average 91.74 and Pip's a 90.99av after 2 long days I felt were very creditable. 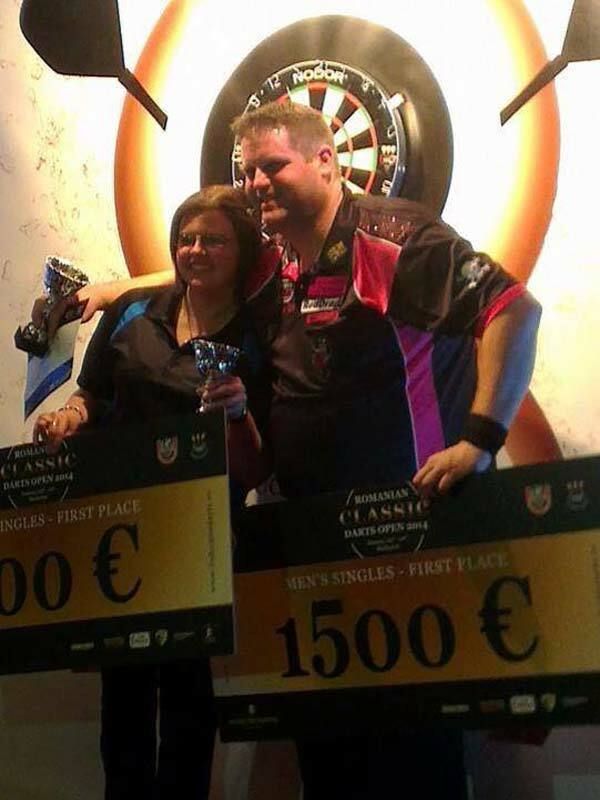 I was very pleased to make the Bulls Muensterland Classic my 8th BDO tour title, currently holder of 4 of those. Many thanks to all my sponsors Motor-Vation Garage, Branksome Carpets, Red Dragon Darts and Designs by Sazz for the most colourful shirts in darts. Next weekend it's on to the Welsh Open and one of the biggest tournaments of the season. Don't forget to be watching the WDO Invitational Comp Live on Eurosport on Saturday evening plus live coverage of the final stages of the 2014 Welsh Open on Sunday. Crowned Muensterland Classic 2014 champion. As always it's great to be part of Team England. My 6th one and it always makes my hair on back of my neck stand up, when putting the shirt on in the hotel at the start of the day. To end the weekend having won Boy's and Girl's Youth. They led the way for the Ladies and Men's Team's victory. This Internationals weekend had a very different to the 5 I'd played in before. All teams and supporters were united across the three nations as one. 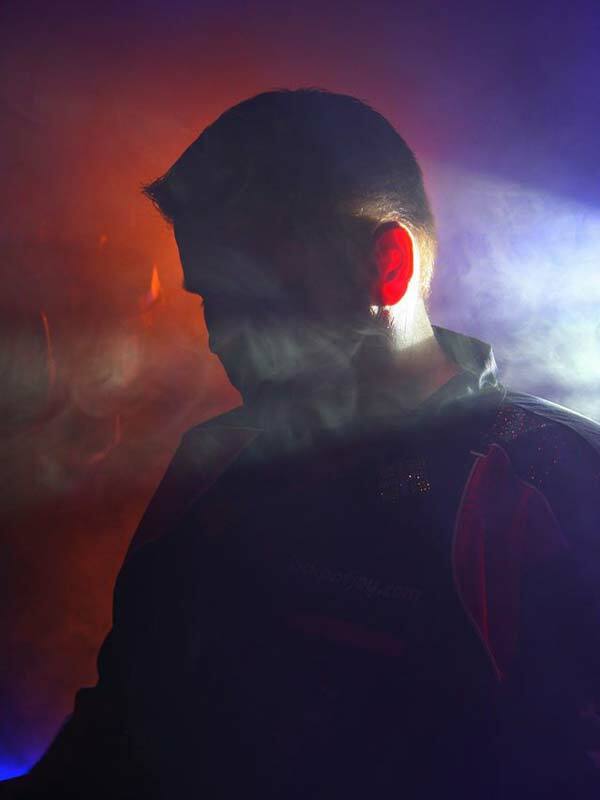 Our darts family had lost a member in Scotland's Bryan Whyte. Bryan tragically lost his life in a car accident few weeks back, just days after receiving his first call up to the Scottish National Squad. Players and officials of all team's wore Scottish flag logo stickers with Bryan's name on. The Scottish team had black armbands as part of their shirts with Bryan's name on. 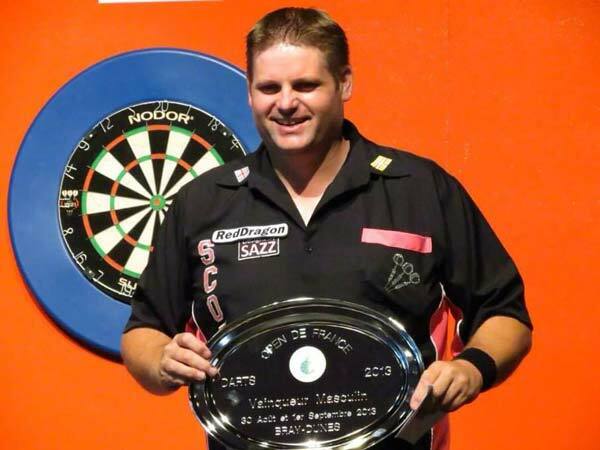 Some knew him well, some knew him as a regular face from the BDO darts circuit and some didn't know him at all. We were united to give this Internationals a friendly, respectful feel. A collection. The signed Scotland v England match board would be returning to Scotland for his family, along with the Scottish shirt with his name on the pocket he would have worn. 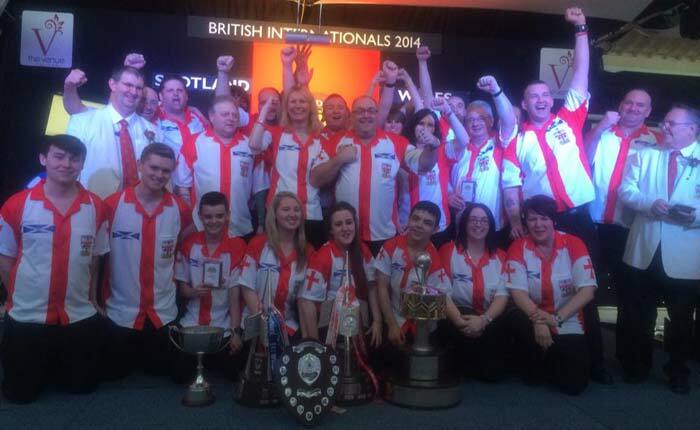 The darts family respectfulness and the togetherness will always see this 2014 competition remembered as "The Bryan Whyte British Internationals". Scott and Richie George won the Pairs title beating Jamie Hughes and Willem Mandigers 5-2 in the final. 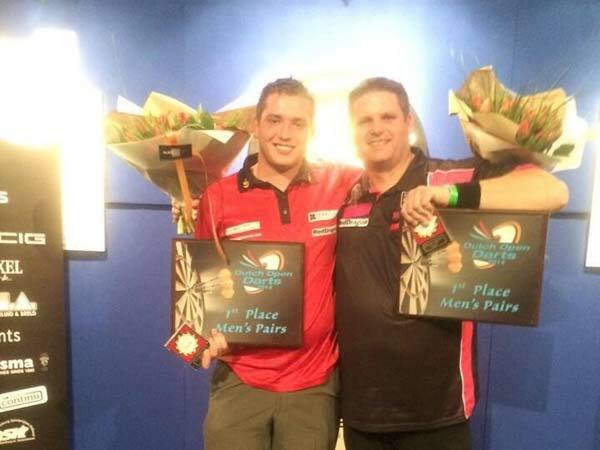 Wins Dutch Open Men's Pairs 2014 with Richie George. Well what a crazy few months it's been. French Open win at start of September, British Open semi-final and last 8 in Jersey. End of November I won Sunparks Open in Belgium for 2nd time. Beating Martin Adams in the final 3 sets to 0. Zuiderduin Masters did not go as planned in December. I had 2 cancelled flights and long delay on last. Arrive in Holland later than planned. My phone fell out of my jacket pocket in the cab from airport. So that was lost. By time it came to playing Jan Dekker in 1st group match it was 30 mins after midnight and I lost 5-3. I felt I'd done well to get 3 under circumstances. 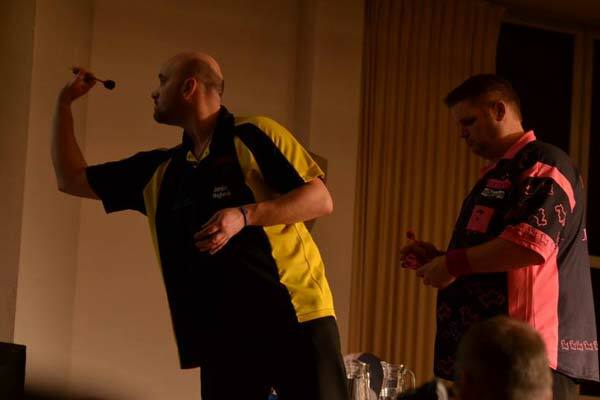 The 2nd match next day in the afternoon v Wesley Harms a 5-1 trouncing was always on the cards. As I walked off stage my only piece of luck all weekend, the taxi driver whose cab I'd lost my phone in had leaned over barrier and said "I have your phone Mr Dog". I am lucky Designs By Sazz had made me a phone cover with my logo dog on it, plus that taxi driver was a dart fan. December had also seen me happily re-sign back with Red Dragon for another 2 years. At end of September I'd also done some throwing in a film due for release in 2014 called London Fields. I threw for a few characters having to hit this an that. I did have an extras part as myself in background in a pub alongside Andy Fordham and Peter Manley, Steve West and some City of London darts lads. Claim to fame for me on that one, I taught Billy Bob Thornton how to throw a dart. Start of January while gearing up for Lakeside I had a call from England selectors to say I'd been re-selected for the 12 man squad and would be standby player for the Six Nations team for February. Good boost before heading to Lakeside. We know what happened at Lakeside. My 2nd 2 clear legs to win match in my 5 visits. Paul Hogan a friend for years ended up on the wrong end of a last set tie break situation, fortunately for me !!! 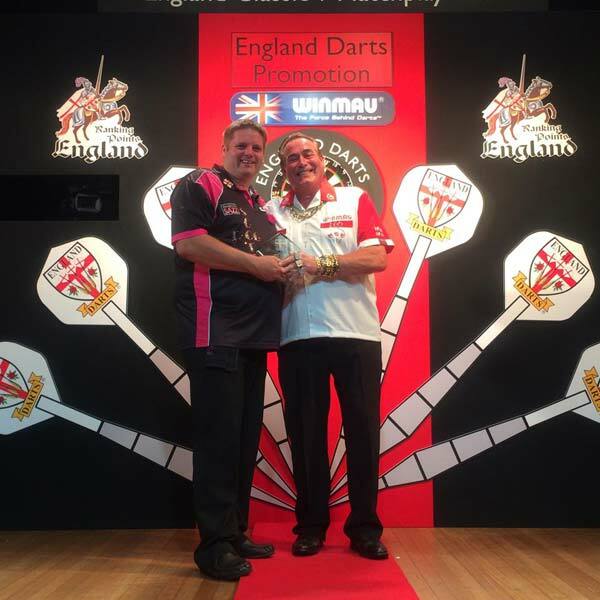 Was pleased to be involved in one of the most memorable matches at Lakeside 2014. Even "the Great" Eric Bristow tweeted "What a proper dart match" I was told !!!! My Dad came to Lakeside an was watching me live for 1st time in 25 years as my sister in law was ill so couldn't attend. By following night dad was signing autographs in the place. Lost out to World No 2 James Wilson in last 16, but progress this year at Lakeside World Championships had been made for me this year, compared to previous. Couple of little errors and it may have been the difference. Enjoyed my stints in commentary with Jim Proudfoot, John Rawling and Vassos Alexander. We had a new champion crowned in Stephen Bunting. A return to county duty for Dorset in Notts for me on the weekend after the World Championships had finished. A 4th man of the match in 5 this year for me. Ironic that my highest average of the season a 32.46 was a loss and the one I didn't get. It was Wednesday evening during the week after county I got the news Stephen Bunting had left the BDO for pastures new. News broke around 11pm on BDO website. A friend had let me know the news via inbox on facebook. I thought immediately about the England set up and did this mean I was going to make the short squad for the 1st time. I was contacted the next day and it was confirmed I was so happy and a proud moment for myself and my family. Romanian Classic was next stop just a couple of days ago. Weather conditions were different to say the least. Snow and -8 temperatures made it good we were staying in the hotel which was darts venue. I won the warm up singles on the Friday evening. I completed the double the following day by being crowned Champion in the Classic event too. I had to overcome my fellow Dorset resident Eddie White 6-5 in final in another edge of seat match. Eddie lost out in Jersey Open final on last leg to Stephen Bunting so 2 finals in 4 outings for Eddie a good start to his 2014 campaign. Although Eddie does need to check weather forecasts for where we are travelling. Not taking a coat was a slight oversight. Our travel companions Sam Head, Gary Stafford from Hampshire and Thomas Chant Dorset all made last 16 and 12 points for them. Thomas should pack his own bag in future as his mum packed him 2 left shoes, one of his and one of his dads !!!!!! I will try not to leave it so long for next report, Scotty Dog. Big thanks to my sponsors for making all this happen for me Motor-Vation Garage, Branksome Carpets, Designs by Sazz and Red Dragon Darts. 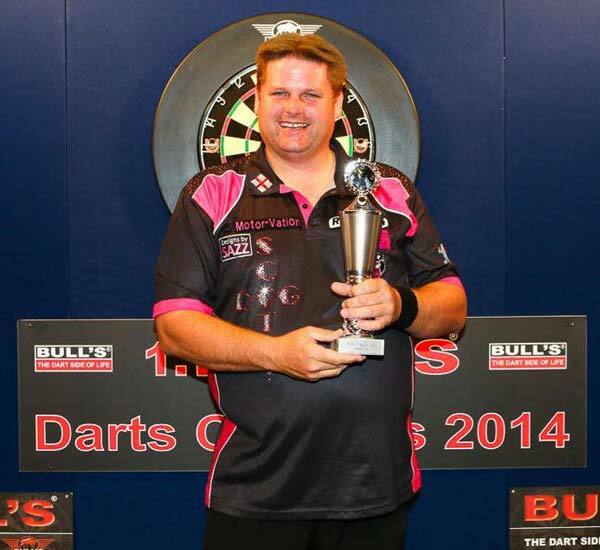 Crowned Romania Classic Darts Open 2014 champion. Crowned Sunparks Masters 2013 champion. Crowned French Open 2013 champion.